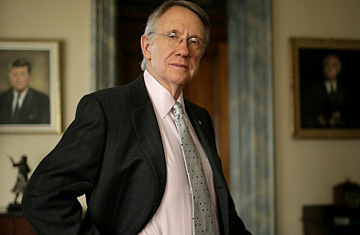 It's easy to understand why people underestimate Harry Reid. He doesn't leave much of an impression, and in all the hoopla over the ascension of Nancy Pelosi on the other side of the Capitol, the new Senate majority leader has been pretty much invisible. When Reid began mumbling something in the chamber a few minutes after the new Senate was sworn in, his colleagues were too caught up in their own conversations to notice that he was giving his inaugural address. "Please," presiding Senator Frank Lautenberg implored, tapping the gavel, "the majority leader is speaking."